This is one of those movies that always looked interesting, but I just never committed to before. I’ve seen it around here and there, but it never really called out to me before I started looking for films to blog about. The blurb on the back doesn’t tell me much more about what to expect than the title and cover do, so I don’t know what I’m getting into, other than a wacky, implausible adventure starring young protagonists. Let’s see how this goes. 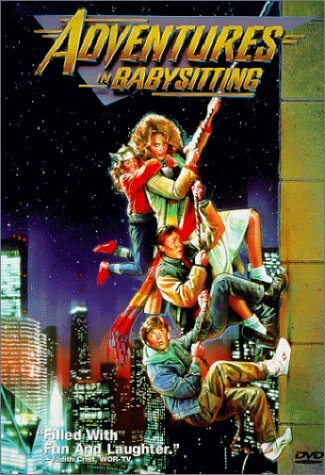 Chris (Elizabeth Shue) gets canceled on for a date, and since she has nothing else to do, ends up babysitting a crazy bunch of kids, which would be a step up considering her boyfriend. The little girl Sara is a major fan of, of all characters, Marvel’s Thor. Her older brother Brad goes stiff as a board around girls, and he has a huge crush on Chris. His friend Daryl is an obnoxious, manipulating, perverted smartmouth. When they’re introduced, these are all at ridiculous levels. Once they fall in a pot of concentrated crazy, those qualities get reigned in by their overwhelming situation. The story is more or less episodic. The gang is swept into action first by Chris’s friend being a bundle of nerves and then by getting caught up in a stolen car ring, who chases them through scene after scene of downtown Chicago local color. Except for the first few minutes, the story seems well-paced, and keeps a good balance of comedy, character development, and tension. I felt Ron Canada’s villain character was too sympathetic as the truly evil ringleader’s putupon lieutenant. But I can’t go into great detail about that without discussing the end. See this movie: as a whirlwind tour through the craziest parts of Chicago. Don’t see this movie: if you can’t see two downtown gangs draw knives without expecting a dancefight to break out.